This overview of honey producing flowers is geared towards apiculture in Hungary, but it provides details on some plants beekeepers in North America will be familiar with too. It provides data on sugar concentration in the nectar from different plants and trees, as well as information in regards to optimal weather conditions and time of day for nectar production. Lindens (refered to as lime in the pdf) do most of their nectar production over night, and thus the bees visit it primarily in the early morning. Black locust, produces best with highs above 25°C on humid days free of wind and rain, but raspberry can do well on cooler wet days. There's lots of lists of flowers to plant to help the bees out there, but this is the first time I've seen a scientific comparison of the attractiveness of different plants. 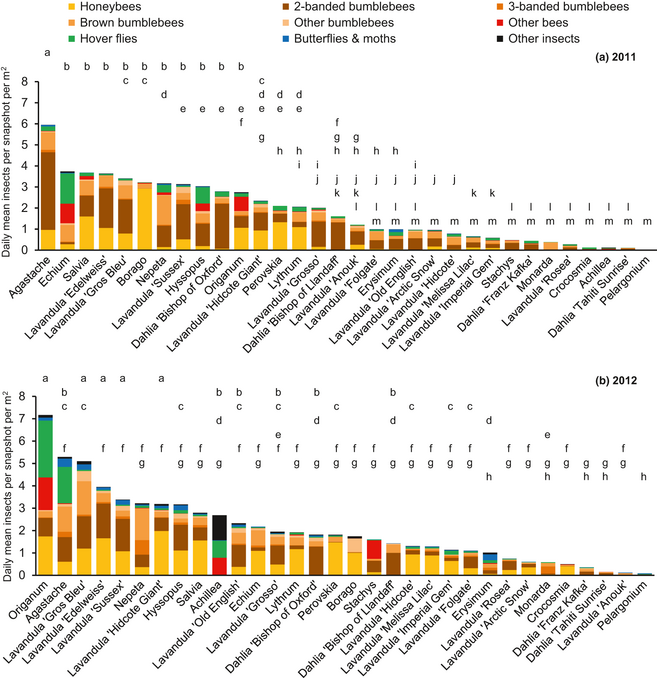 Figure 3 from the paper seems to offer a quick glimpse at which types of flowers were the favourites. I've been interested in agastache (anise hyssop), since reading praise for it in beekeeping literature a few years ago and because it's native to North America. This gives me a little extra incentive to try planting a little more of it. I sent Mihail a question and he was quick to remind me that this study was only conducted in one area and results may vary in different regions. So you may want to take this research as inspiration to try setting up a test garden near your own bees and see how your results compare. A detailed list of favoured forage sources for Honeybees which looks at both the quality of nectar and pollen as well as estimating the per acre yield. A few years ago Dave Barr introduced me to the concept of Growing degree days(GDD), a calculation of accumulated heat that helps you to predict the blossoming of plants and trees with pretty good accuracy. It's no subsititute for physically looking around you and taking note of what is in bloom, but following the GDD might help predict the timing of flows and corresponding seasonal bee behaviour. See wikipedia for a detailed explanation on how the calculation is made and flowering time of various plants. Use this calculator to check the GDD for your area. All GDD references are given using base 10 throughout the rest of this post. What I have noticed over the past few years is that bees will start returning to the hive with full pollen baskets as the growing degree days rise just above 0 C.
One of the more detailed theories on bee behaviour in early spring I've been able to find is on Michael Bush's site. 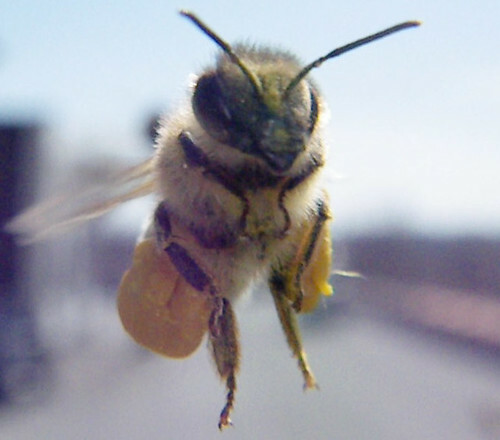 It attempts to relate certain changes in hive behaviour to bloom times. You may be in a different region than Michael, and things may progress at an unusual rate this year, but I think it will be interesting to keep an eye out for any of the correlations he mentions in the next month or two. - If the brood nest starts contracting before the peak of the apple blossoms - they may be switching from buildup to swarm preparation. 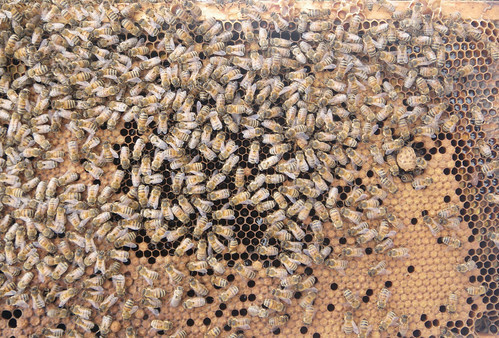 Look for backfilling, or patches of nectar surrounded by brood like in the photo below. - When the Black locust blooms (140 C-160 C GDD) should be the start of the main flow and the interest in initiating a swarming should be reduced. - Established colonies start making white wax shortly afterwards. My hypothesis is, that for here in Ontario, around 70-100 C GDD might be a good time to look for the first signs of swarming preperation, with Queen eggs most likely appearing around 115-160 C GDD. However, I imagine with the large amount of stores the bees still have after what was a mild winter, they could run out of space even before this. 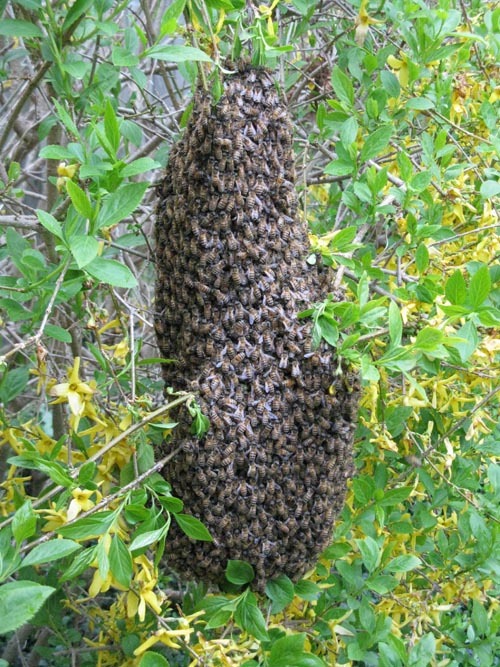 The first swarm in my area was a few days later at 65.5 GDD or about three weeks after the dandelions first bloom, two weeks after the apples and at about the time the lilac trees were in bloom. 2013: I observed eggs and larvae in queen cups at 88.5 GDD. 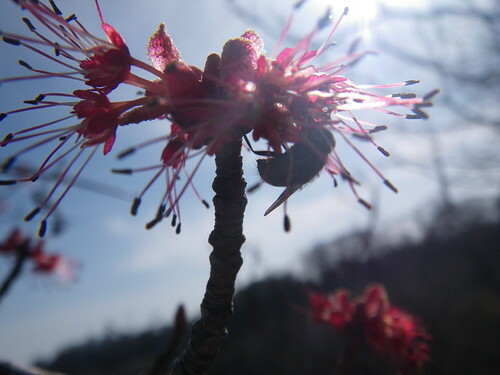 A little under a week after the apple blooms, two weeks after the dandelions and about the time the lillacs bloomed, but it's possible they were supercedure cells. It was a cool and wet spring, and I'm not sure there was very many reproductive swarms. I did find a feral colony that had moved in sometime before 95 GDD, but the first report of an actual swarm in the area did not come till around 265 GDD. 2014: Very, very cold winter, with a long cool spring. First report of a queen cell came from a friend around 50 GDD at the time the apple bloom started and two weeks after the dandelions. The first swarm report I heard reported came four weeks later at 252 GDD, about a week after the black locust bloom.